Please do not link to these pages! The new site is up at http://botanyphoto.botanicalgarden.ubc.ca/. These pages are gradually being removed as we update the content on the new site. I thought I'd follow up yesterday's Arbutus menziesii with another tree species I am anxious to spend more time photographing. These photographs were taken in late March. Platanus wrightii, or Arizona sycamore, is one of ten species in the genus Platanus; in turn, Platanus is the only genus in the family Platanaceae. The genus Platanus has an odd biogeographical distribution: 1 species found in Vietnam and Laos, another in southeast Europe and southwest Asia, and the remainder in eastern North America, southwest USA and Mexico. The centre of diversity for the species is certainly Mexico, where six of the ten species occur. It reminds me of the distribution of Styracaceae, though more restricted in scope and entirely absent in South America – I'll follow-up with a post about the Styracaceae in a later BPotD. 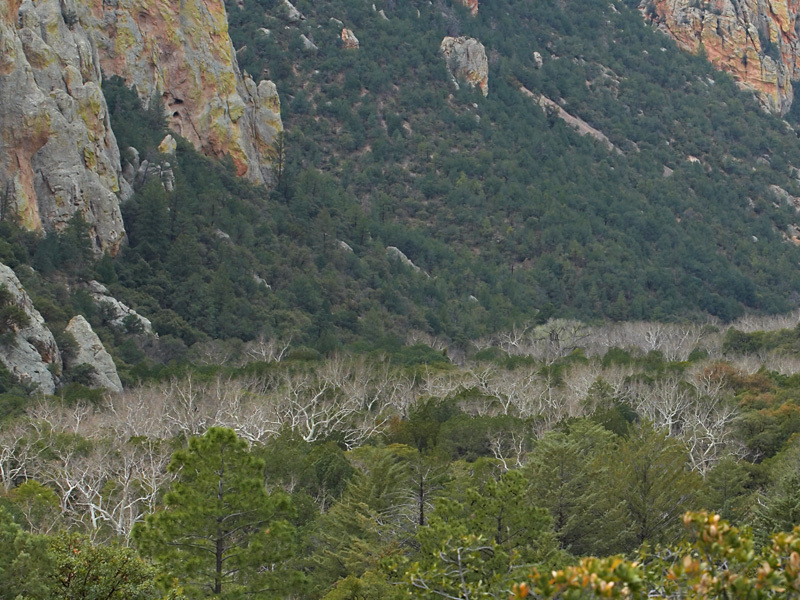 You might notice in the landscape photograph that the trees are found at the base of the rocky hillsides. More specifically, they are typically found along watercourses which would perhaps be better illustrated with an aerial photograph (I didn't have a spare airplane, though). The second photograph is an attempt to demonstrate what I consider the ghostly nature of these trees. I like to imagine I'll be able to spend a few weeks sometime making more attempts. By the way, if you're interested in a close-up of the bark, you can visit this “stumper” I posted on the UBC discussion forums (What is a stumper?). I feel very glad to see these unusual photographs of an area and trees I gained much joy from several years ago. My husband and I spent perhaps a week in these mountains, which are noted for their Apache and Chief Cochise history as well as for their relative isolation, wild life and relatively unusual trees. 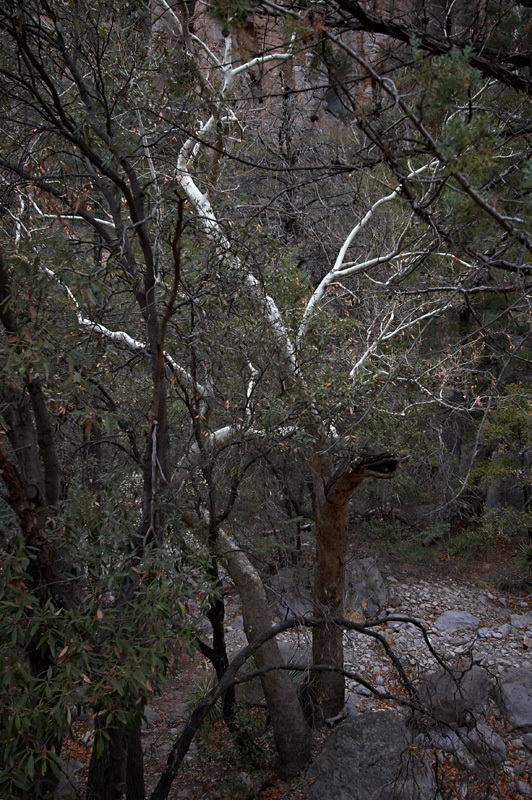 The altitude of this particular area gave us cold nights and an early frost while the days shone clear and bright, all of which was an ethereal contrast to the seemingly stark history directed, it appeared, mostly to Chief Cochise's demise among this species of tree. The beauty found in this rugged area is a joyful gift to be treasured. Thanks Sheila. I absolutely agree about the area - it was one of the highlights of that trip. What is the urban/temp tolerance for this particular Platanus? As an L.Arch in the Northeast, we are having trouble here with Asian Long Horned Beetles which are beginning to move in on our P.acerfolia & P.occidentalis populations. Massed among the green like that, it's truly magnificent. It is considered to be hardy to zone 6 by some sources, zone 7 in others. In places that have summer rain, it is considered a great street tree. Those are beautiful shots. I really like the composition in both cases.